Babe Ruth is a player who needs no introduction and Babe Ruth cards are equally important in the hobby. Widely considered one of the greatest baseball players in history, Ruth was a star before athletes were stars. His dynamic personality and the ease in which he seemingly dominated the sport, earned him a legion of fans and collectors. 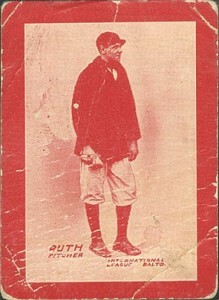 As such, Babe Ruth cards are the most sought-after collectibles in the hobby, and were it not for a certain short-printed Honus Wagner tobacco card, Ruth would own the undisputed crown for most valuable baseball card. Originally a pitcher when he entered the league with the Boston Red Sox, Babe Ruth cemented his legacy in baseball lore as a power hitter for the New York Yankees. The 1918 trade that brought him from Boston to New York grew to mythical proportions as the Red Sox failed to win a World Series for 86 years after he left the team. "The Curse of the Bambino" was eventually broken in 2004, when Boston finally prevailed as World Series Champions. In 1921, Babe Ruth set the single-season home run record with 59. He would better that total in 1927, knocking in 60 home runs. This record would stand for 34 years, until Roger Maris bested it by one home run in 1961. Shop for Babe Ruth cards on eBay. When Babe Ruth finally hung up his cleats for good, he was a seven-time World Series champ and was named AL MVP in 1923. He also lead the AL in total home runs for 12 seasons and total RBI for six seasons. 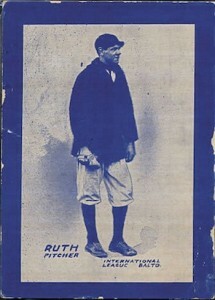 Ruth was only named an All-Star on two occasions, but the All-Star game did not originate until 1933 and Ruth retired in 1935. He was inducted into the Baseball Hall of Fame in 1936. Unfortunately, Babe Ruth died only a decade later in 1948 after a battle with cancer. Many of the baseball cards from Babe Ruth's playing days are obscure offerings with a limited release. However, the ones that surface in good condition generally sell for huge amounts. 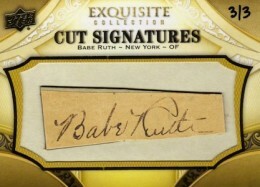 The following list aims to identify the ten most valuable Babe Ruth cards in existence. Because rarity and condition greatly affect value, historical significance was also factored into this list. See the most popular cards for Ruth on eBay using our real-time hot list. Due to the incredible values seen by Babe Ruth cards, narrowing down the list meant that a few popular cards did not make the cut. While time may reveal other hidden gems, the following list represents the dream checklist for many Babe Ruth card collectors. All the cards are worth a small (or large) fortune, and prices generally start around $5,000, and can escalate very quickly. Not all Babe Ruth cards will cost you a mortgage payment, or twenty. Here are 10 vintage Babe Ruth cards that can be found for under $50. Shop available cards on eBay using the links below. 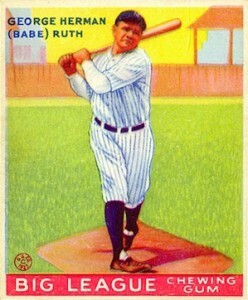 The 1914 Baltimore News Babe Ruth card is the very first card for "the Bambino," and easily his most valuable. The set centered around the two professional baseball teams based in Baltimore at the time. This included the Baltimore Terrapins from the Federal League, and the Baltimore Orioles of the International League. Baltimore was also Ruth's hometown, and at this time he was a virtually unknown minor league player for the Orioles. The image shows a very young Babe Ruth, fresh out of St. Mary's Industrial School for Boys. The cards were issued with blue or red fronts, and there were also back variations. A red PSA 1 (PR) version was sold in 2013 by Robert Edward Auctions (REA) for $450,300. As the first card to show Babe Ruth as a pro, the M101 is significant for many collectors. 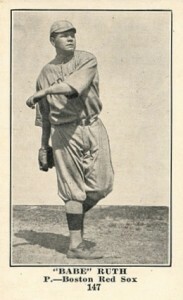 The image shows the lean pitching phenom as a member of the Boston Red Sox. 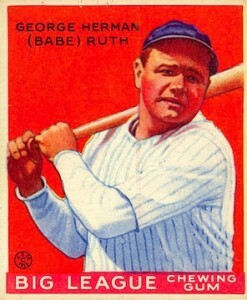 While not his "official" rookie card, this is the card that is widely viewed as the true Babe Ruth true rookie card. There is some confusion because it was originally it was thought that the M101-5 set was issued in 1915 and the M101-4 set was issued in 1916. However, the M101-4 features an identical front and is now believed to have been released only a few months after the M101-5. The general consensus is that both are equally considered to be Babe Ruth rookie cards. 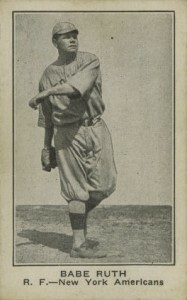 Although the set is commonly associated with Sporting News, 18 different advertisers are featured on the backs of these cards and there are also blank backs. Several advertisers overlapped between the two releases. 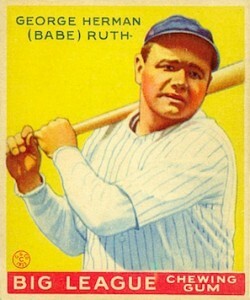 While both Ruth cards are number 151, most of the other players do not have the same card number for both sets. A PSA 3 (VG) M101-4 Ware's Basement Sporting Goods was sold by REA for $130,350 in 2013. In fairness, this is the only PSA-graded version with a Ware's Basement Sporting Goods card back, in existence. In 2013, Heritage Auctions (HA) sold an SGC 70 (EX+) M101-5 with a blank back for $83,650. Another card included in virtually identical sets, the Babe Ruth cards found in 1917 E135 Collins-McCarthy and 1917 H801-8 Boston Store are both number 147. The only true difference comes from the advertisers on the card backs. The card design greatly mirrors the M101-4 and 5 of the previous year. Once again, Ruth is shown in a pitching stance. A PSA 4.5 (VG-EX+) version was sold by REA for $65,175 in 2013. Not generally thought of amongst the top Babe Ruth cards, the 1921 Frederick Foto card is a very unique collectible. 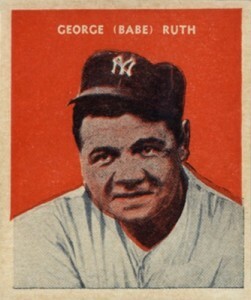 Showcasing a photo-quality image of Ruth, it lists "the Babe" as a member of the New York Yankees, despite showing him in a Boston Red Sox uniform. Although some may question its designation as a card, it deserves a place on this list based on value and rarity. An SGC 45 (VG+) version was sold for $44,437.50 by REA in 2013. Using the same image and design as the 1917 E135 Collins-McCarthy and H801-8 Boston Store cards, this Babe Ruth card lists his team as the New York Americans. There are actually three variations of this card that all list different names. The version shown below uses simply Babe Ruth. Another version also has Babe Ruth, but "Babe" is listed in quotations. 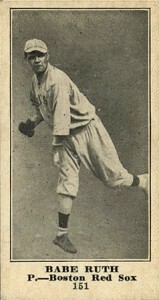 The third version features his official name, George Ruth. HA sold an SGC 86 (NM+) version for $19,418.75 in 2013. 1932 U.S. Caramel is a multi-sport set that includes golfers, boxers and baseball players and Babe Ruth is the last card in the set. The red background immediately catches the eye, as does the profile shot of a relaxed Babe Ruth, sporting the iconic NY ball cap. The general design is similar to the 1933 Goudey Baseball. The 1933 R306 Butter Cream Confectionery card is one of the rarest options for Babe Ruth card collectors. With just a few documented examples in existence, only two remain by virtue of bad luck, after the third was apparently thrown away by mistake. The card is very narrow, with dimensions of 1-/4" x 3-1/2". The card backs offer two variations that deal with a promotion for collecting all 30 cards. One version references September (SEPT), and the other shows October (OCT). While many Babe Ruth cards were released before 1933 Goudey Baseball, these four cards are the only official rookie cards for "the Sultan of Swat." Card #53 (yellow) and card #149 (red) both feature the same image of Ruth. Card #181 (green) showcases a different close-up image of Ruth, while card #144 shows him warming up, with a field and several structures in the background. Card #53 is the rarest and most condition sensitive. Understandably, this Babe Ruth card with a yellow background is also the most valuable. REA sold a PSA 8 (NM-MT) version of card #53 for $59,250 in 2013. Arguably one of the best designs from Babe Ruth's playing days, 1933 Sport Kings includes 18 different sports in its varied checklist, with only three baseball players. 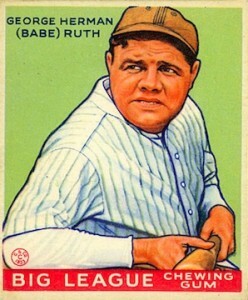 Like 1933 Goudey, the Sport Kings card showcases a colorful and detailed sketch of Ruth, with a light green background. Current collectors may recognize the design, which is the same used for base cards in the modern Sportkings Series. 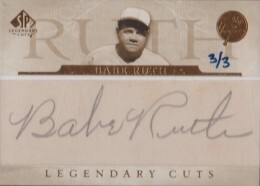 Although the more recent Babe Ruth cards do not normally intrigue collectors in the same way as his original cards do, one of the few exceptions is cut signature autograph cards. These extremely low-numbered cards perfectly fuse old school with new school and have created a very valuable chase for collectors. The most sought-after and valuable versions usually contain a jersey or bat piece, in addition to the cut signature. I have a 1992 Trivia Babe Ruth card with a man on his left that is holding a crown over Babe’s head and a smaller (jockey-looking guy behind his right shoulder. In bottom left of card, it reads “TRIVIA” below that “Never Won A Triple Crown”. the card is black & white. On backside of card is “BABE RUTH” and “102” on top of card; then, “The Triple Crown Race” with its story below. Then statistics listed for Babe Ruth for years 1921-1931 home runs, RBIs & Batting Average stats! Near very bottom, “The Babe Ruth Collection” “1992 Megacards, Inc.” Also, stated on bottom of card, “Photo New York Daily News, New York, NY All Rights Reserved Printed in U.S.A.” Can you give me any info on the value of this card?? I appreciate any help you can provide! Patti Jackson � Unfortunately, it is a common card. They sell for $1-2 on eBay. I have a Babe Ruth card and on the back it says 9-20-1927. value? I have a megacard black and white with gold trim of Babe Ruth. The photo shows on aug. 14, 1934.Babe Ruth scores from 2nd base on a single hit by teammate Bill Dickey. catcher Ray Hayworth of the tigers dives toward Ruth it,s close,but Babe is safe.The back of the card shows the history of him. I have the Murder’s Row Quad auto from Upper Deck a true 1/1. Cut signatures of Babe Ruth, Lou Gehrig, Tony Lazzeri, and Bob Meusel. What is odd is that while being a 1/1 it is also an error card because somehow Upper Deck listed Lou Gehrig as an outfielder, not as playing first base. With so many cards, it sounds like you’d be best served trying to find a hobby shop that might be able to help you identify what you have. I found a Babe Ruth card that I can’t find any information about online. It’s in a plastic case that says “1934 Quaker Oats #15 Babe Ruth”. The front side shows him in a hitting position and the back fielding the ball. There is no writing on the card. it almost looks like a small picture and not what I would think of a typical baseball card. Just wondering if it is worth anything or not. I have a Babe Ruth, unsigned #3 base ball card. Is this card worth anything? I have a Babe Ruth card in brown and white, marked Guyana $350. On the back is No.7. On the back is a short tale of his runs. The card has to be printed since 1930 since it tells of homeruns in the 1920,21,23,27,28,and 1930. Anyone know how I can find a price in this or is anyone interested in it? Oh, the card is also signed by him. I have a grade 5 four-in-one 1929-30 Ruth/Gehrig with red ink. Any idea of the value? 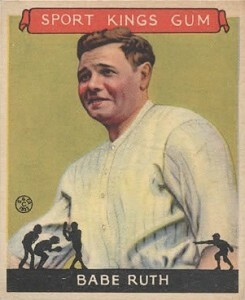 1924 babe Ruth baseball card . What is the value? I have a George (Babe)Ruthbaseball card and I need to know how much it’s worth.I have a Joe Louis boxing card and want to know the same? I have a Babe Ruth card that says;The All Time- R.B.I. Leader c and shows **** 2,209 . On the back of the card there is other players names listed with their runs batted in ; there are 9 other players names listed; some names include-HANK Aaron,Lou Gehrig,Ty Con,Willie Mays and others.Is this card of any value? The 1933 Goudey #149 will always be my favorite. That blood orange just looks great! I have several Babe Ruth baseball cards starting from 1914 to 1933 and would liketo know their value. Is there a website that I can go to to find the value or is there a book that I can purchase?